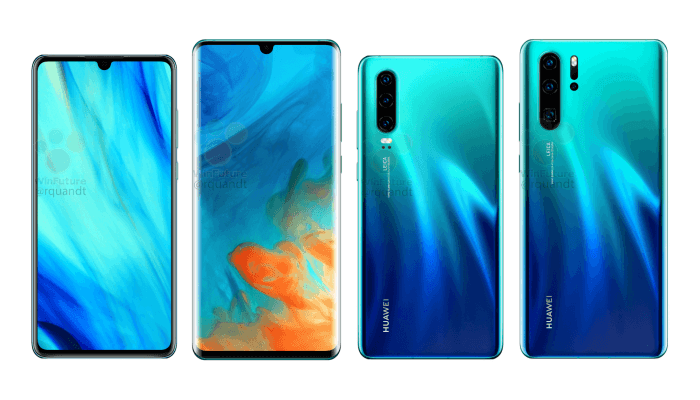 Huawei P30 and Huawei P30 Pro Full Specifications Emerged - Playfuldroid! The Huawei P30 and P30 Pro will be announced in Paris, France through a launch event on March 26. Both phones will come equipped with flagship specifications and they will offer amazing photography experience like the predecessor P-series phones. A fresh leak has revealed the entire specifications of both phones. The Huawei P30 will feature a flat OLED panel of 6.1 inches whereas the P30 Pro phone will have a curved OLED display of 6.47 inches. Both phones will have waterdrop notch screens that will offer full HD+ resolution. These phones will include in-display fingerprint readers. The Kirin 980 will power the P30 duo. The P30 and P30 Pro will respectively feature 6 GB and 8 GB of RAM. The P30 will have an inbuilt storage of 128 GB whereas the Pro model will come in 128 GB, 256 GB and 512 GB models. These phones will have nanoSD cards for additional storage. The EMUI 9.1 flavored Android 9 Pie OS will come preloaded on both phones. The P30 will have a 3,650mAh battery whereas the larger 4,200mAh battery with 40W fast charging will be available on the P30 Pro. The Huawei P30 will feature a Leica certified 40-megapixel lens + 16-megapixel wide-angle sensor + 8-megapixel zoom lens triple camera setup that will support 5x loseless zoom. The Huawei P30 Pro will come with 40-megapixel sensor with OIS + 20-megapixel wide-angle lens + 8-megapixel telephoto lens triple camera unit coupled with a ToF (Time of Flight) sensor. The P30 and P30 Pro will include a 32-megapixel front-facing camera. The P30 will feature a 3.5mm audio jack. The P30 will be lacking it, but it will include an IR blaster that won’t be available on the P30. Black, White and Blue are three color variants of the phone. The P30 Pro will be available in an extra color option of Red.